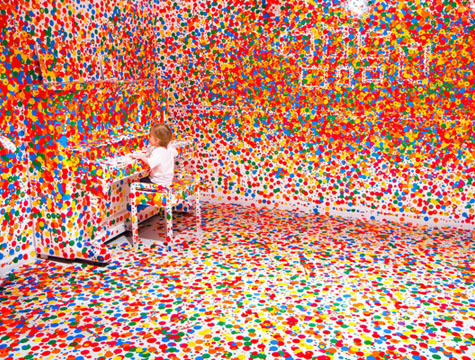 The Obliteration Room is a temporary interactive installation by Yayoi Kusama. The installation recreates an Australian domestic environment in/as a gallery space. The white room is gradually obliterated over the course of the exhibition, the space changing measurably with the passage of time as the dots accumulate as a result of thousands and thousands of collaborators.